The Outbox is not garbage, nor does it need to be an actual box; it is a halfway house where things sit while their fate is being decided. You should never be afraid to put something in the Outbox. This was an easy assignment for me because we pretty much set up an Outbox area from the very beginning. We referred to it as the donation pile, as in if it sat there long enough to where we got a donation pick-up notice in the mail then it would get donated. It’s in between the kitchen and entertainment room right by the sliding door. When we first moved in this was where we’d throw our empty boxes. Now it’s the Outbox. 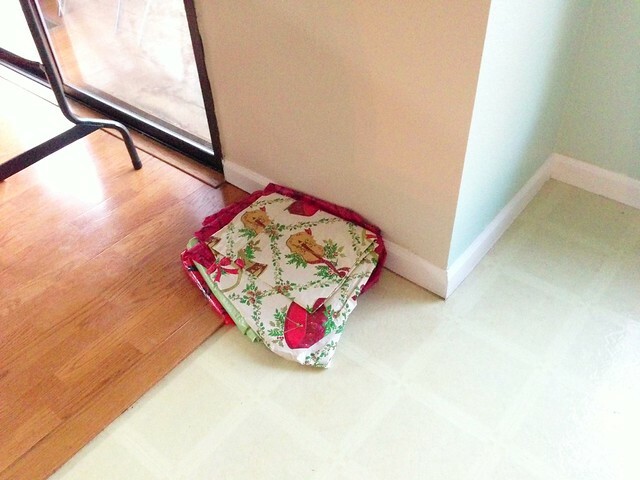 I already had items that needed to be put in the Outbox: extra Christmas tablecloths. When my friends helped me take down my Christmas stuff on Tuesday, I took the opportunity to go through my general holiday/party container to see what I could put in my buffet. Turns out, I had a LOT of tablecloths I forgot about. I fit what I could/wanted into my buffet and the rest is getting donated. Or in this case, it’s getting put in the Outbox.